One of our most popular gift baskets is our Premium Music City Basket. We're giving you an inside look at what makes this basket so great....hint: it's all about the makers! 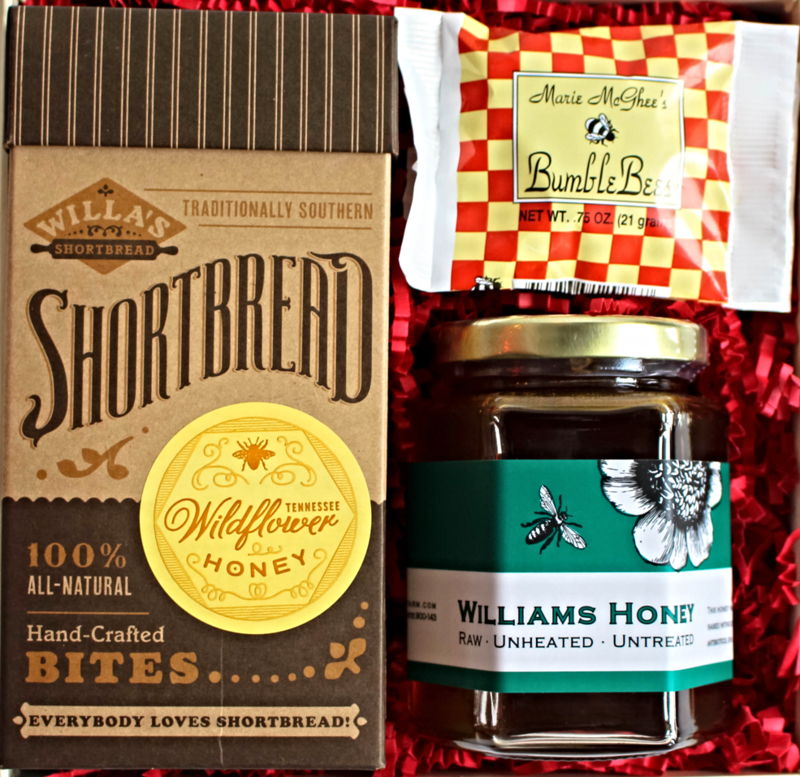 Willa's Shortbread has been perfecting shortbread cookies for more than 30 years and these Tennessee Honey ones are the perfect sweet snack. This Made in the Shade blend of locally roasted coffee from Bongo Java is a darker roast with smokey, nutty notes and a Heavy Body. This biscuit mix was created by a Southern Chef and makes about a dozen soft and delicious biscuits. Easy to make and even easier to eat! Strawberry Jam from The Nashville Jam Co. The Nashville Jam Co. makes all natural jams from real fruit. This strawberry jam tastes like Summer sunkissed strawberries year-round and pairs perfectly with biscuits and more. One of the most iconic items in our basket, GooGoo Clusters are a Music City staple and the oldest combination candy in the world. Each GooGoo is made with real milk chocolate, caramel, peanuts and marshmallow nougat. Since 1912, people have been GaGa for GooGoos! Nola Snacks makes the best granola you'll every try. This flavor has bourbon-soaked pecans and delicious snacking granola made with all natural ingredients in small batches. Eat it as a snack, over milk, with yogurt, or more. Brittle Brother's brittle is the nuttiest, yummiest brittle. Caramel Corn that's not too sweet and has just the right amount of caramel goodness. This sweet treat from Nashville Chocolate & Nut Co. is hard to put down. Gourmet oatmeal on the go or at home, this Cinnamon Girl blend is a heavenly blend of cinnamon, apple, raisins, and pecans. We're so proud of each of these local makers and the delicious foods they've created. 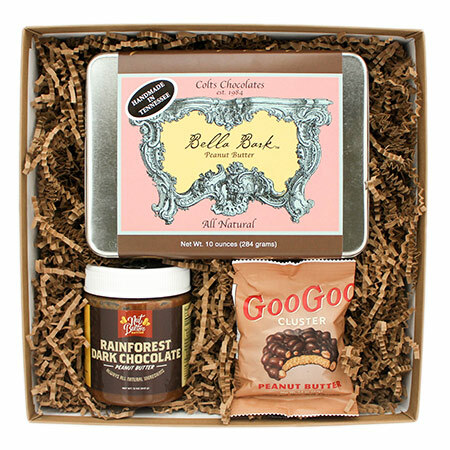 Every item has been "taste tested" at the High Note Gifts headquarters more times than we should admit (shhhhh), so we know you'll love them too! Nashville is a great city to bring corporate events, conferences, and meetings. This city has a lot of great food, entertainment, new hotels, and Southern charm. It's our honor to be able to provide welcome gifts for many of the conferences hosted here in Music City to not only welcome them to town, but to send them home with something made in Nashville to remember their trip. When companies are giving gifts for a large number of attendee's, they often have a specific budget they need to stay within for their event planning. We work with companies and event planners around any budget to help design a custom gift that fits into their price range and shares the spirit of Nashville with their guests. These gifts included Tennessee Wildflower Honey Shortbread Cookies from Willa's Shortbread, "I Walk the Lime" soap bar from Music City Suds, a milk chocolate music note pop from Nashville Chocolate & Nut Co., and a Nashville skyline postcard designed by Anderson Design. 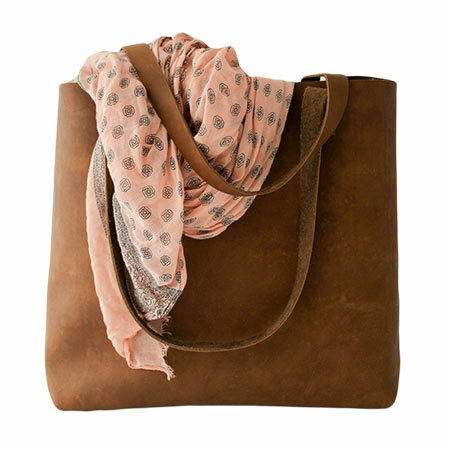 Each item was made locally and is a fun way to share a little bit of Nashville. Hosting your own event in Nashville? 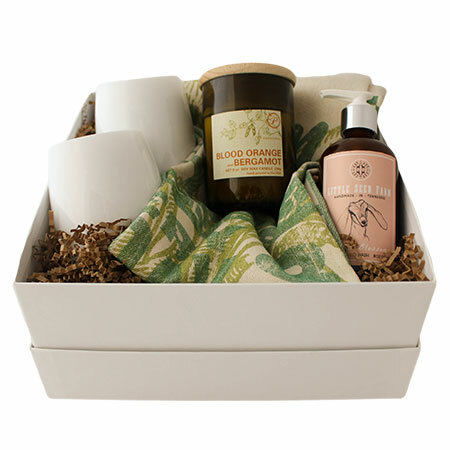 Contact us today and we'll help you with the perfect welcome gifts, thank you gifts, or parting gifts. Our gifts will enhance their Nashville experience and keep them thinking of you long after the event. See our Event Gifts page for more details or let us help you customize something just for you. Father's Day is Sunday, June 19th! Skip the ties and golf balls this year and get Dad something that's perfect for him that he is sure to enjoy. We've handpicked a few gift ideas from our line of exclusively Nashville-made, premium quality goods. This "People Tested - Pig Approved" BBQ sauce is a secret recipe from Nashville's Hog Haven and was chosen by Southern Living Magazine as "the South's Best Barbecue Sauce". Paired with two grill seasoning blends from J.M. Thomason, this set makes for the perfect gift for the grill master in your life. Nashville’s most innovative creators infuse traditional distillery craftsmanship into everything from tasty artisan brittle to delicious apple jam. Apple Bourbon Jam from Nashville Jam Co.
Nashville-style Hot Chicken is the Music City’s claim to fame and it's hotter than ever. Use the same hot chicken seasoning many of Nashville’s restaurants use and breading from the famous Loveless Café to make your own hot chicken at home. 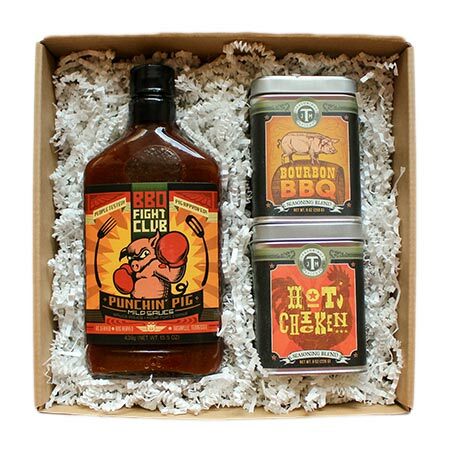 Plus, find recipes and more in this Hot Chicken Cookbook from Timothy Davis, a local Nashville resident, chef, and writer, making this the ultimate Hot Chicken gift set. 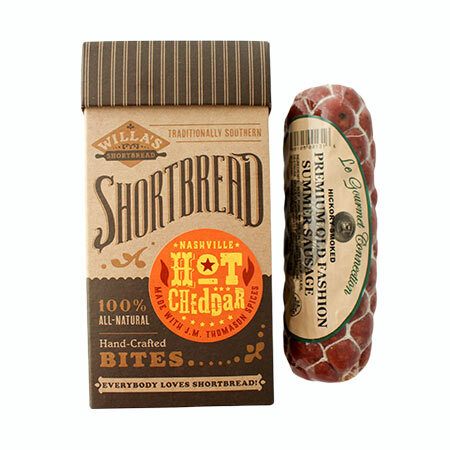 Hot Chicken Crackers from Nashville Chocolate & Nut Co.
Our Marathon Runner Gift Set is perfect for runners, athletes, or hardworking men and women to help them prepare, recover, and stay at the top of their game. Cinco De Mayo is a date that commemorates an unlikely Mexican army victory over French forces in the Battle of Puebla in 1862. America celebrated with Mexico as a defeat of French troops meant those same troops wouldn't be making their way to US territory during our own Civil War. American's love to celebrate the victory of an underdog and that's just what we'll get to do on Cinco De Mayo. However, most of us know that it's also a holiday that has become all about eating tacos, drinking margaritas, and another reason to host festive get togethers. We've rounded up some of our favorite party ideas for Cinco De Mayo here. Feliz Cinco De Mayo, Amigos! They say everyone gets their 15 minutes of fame. Well, we didn't have 15 minutes, but we did get about 15 seconds on national television and it was so much fun! Just a few days prior to Thanksgiving 2015, we were contacted by a correspondent for The Today Show on NBC. She was reaching out to see if we would be willing to send a couple of our signature Bourbon Bundle gift baskets to Rockefeller Center so we could be featured in a gift segment on NBC the Saturday after Thanksgiving. Our answer? Uh, yeesss! So we frantically packaged up gifts, tied each ribbon to perfection, and sent them off to New York City just in time for our very first television debut. Then we set our alarms to get up early on a Saturday morning. You never know what will happen on live television, so we were still holding our breathe that this was really going to happen. With a large cup of coffee in hand, we anxiously waited to see if we made the cut. And then it happened! Before we even got to see it air, we were getting flooded with orders into our inbox. Nashville is one hour behind the east coast, so it aired before we could see it. And people must have liked what they saw! In the first 20 minutes after it aired Eastern Standard Time, we had already exceeded our expectations for orders. Then it aired in Central time, Mountain time, and Pacific time. Everyone in the country that was up on a Saturday morning tuned into NBC saw us and so many of you came to our website to get a Bourbon Bundle for yourself or someone special. So, we had our work cut out for us and so did our local artisan suppliers! Just weeks before Christmas, we got to work filling orders as fast as we could get them out the door. It turns out that Americans love their Bourbon and they know something good when they see it. It was a fun experience and we're not sure what can top that, but we're ready for our next television spotlight! Valentine’s Day is just around the corner. It’s the sweetest day of the whole year and while we highly encourage you to tell your loved ones year-round how much you care, Valentine’s Day is a fun way to celebrate. Whether you’re sending love to a significant other, a friend, family member, or co-worker, we’ve got a few great gift ideas for you! Okay, it's not actually filled with gold, but it is filled with chocolate and that's kind of the same thing. This small gold heart-shaped gift box is filled with delicious heart-shaped brownie bites filled with roasted pecans and covered in smooth milk chocolate and they're oh-so-good! Something sweet for your Honey! This ivory gift box includes local honey, Tennessee Honey shortbread cookie bites, and two Bumble Bee chocolates made with salted caramel, roasted pecans and a rich milk chocolate. Valentine’s Day can be all about dainty chocolates and flowers, but your guy should get to celebrate with something a little more his speed. 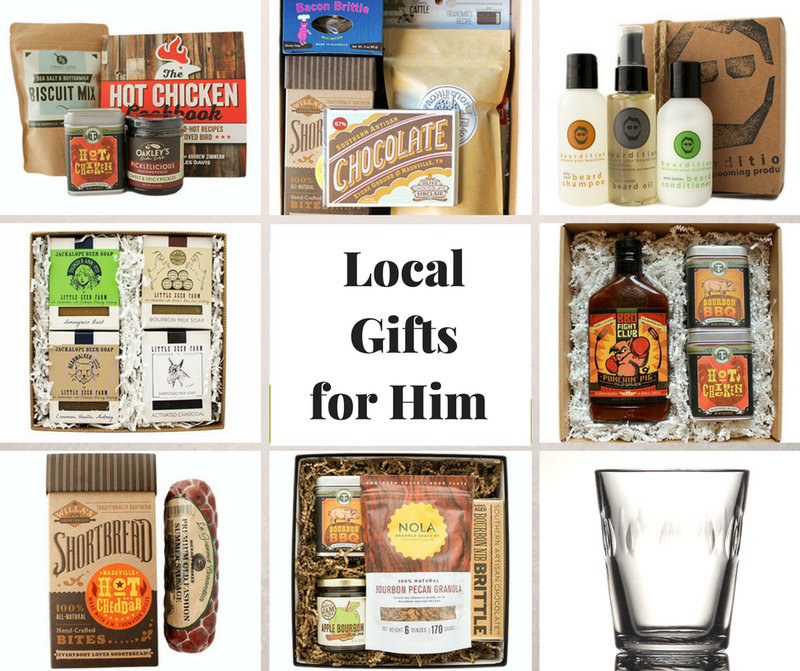 Gift him with a Bourbon Bundle filled with all things infused with the flavor of bourbon and it will be love at first sight! This collection of small-batch goods includes a hand poured candle, beeswax lip balm and a bar of soft goat’s milk soap, all tucked into a handmade clutch with this beautiful red pattern. 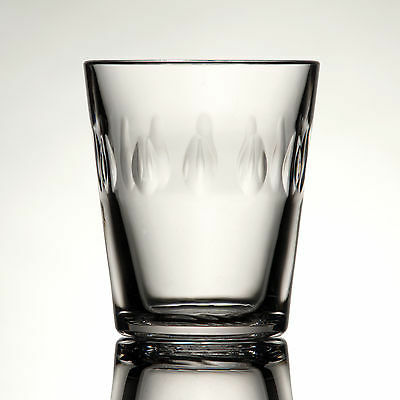 Elevate your dinner in with these beautiful wine glasses made from a durable polymer that make them nearly unbreakable, and dishwasher safe. As always, if we can help customize a gift that’s perfect for you, just let us know. We love our customers and we hope that your all your days will be filled with love, laughter, friendship, and meaning. Happy Valentine’s Day! Have you tried Nola Granola yet? If not, you're missing out on something scrumptious. Local snack foods maker, Nola Snacks produces uniquely flavored artisan granola from all natural ingredients right here in Nashville, TN. Choose from Chocolate Almond, Bourbon Pecan, or our personal favorite, Salted Caramel. 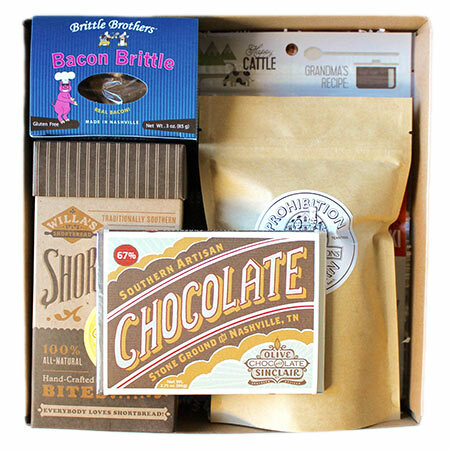 In fact, it's so good that you'll find it now in our Large Nashville Gift Crate and soon to appear in our upcoming Southern Breakfast Collection. Nothing but the very best will do for our gift options. Comment below to tell us if you've tried Nola Granola and how you enjoy your favorite flavor. Making a List. Checking it Twice. You pulled off Thanksgiving! Maybe you hosted this year for the first time ever, or maybe you've been hosting for many years now. Or perhaps you're a champion at eating and napping and you know to leave the hosting to the experts in the kitchen. However you spent Thanksgiving, you made it through and now it's the official start to the Christmas season! If you're superhuman, you've already finished your Christmas shopping. But if you're a normal human being, you are just getting started. The month of December is sure to fly by with Holiday parties, decorating the house, seeing family and friends, and making the most of this wonderful time of the year! 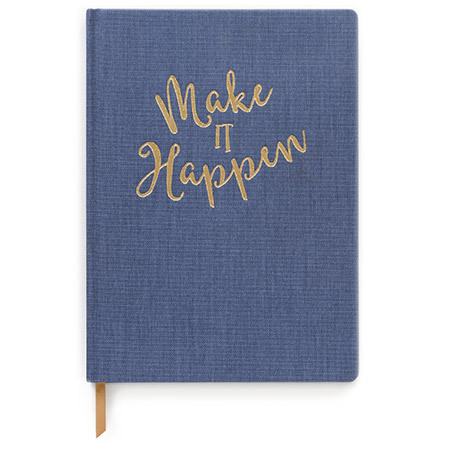 So, we're helping you get organized now to be sure you tackle your gift list this year in style. Our 2014 Nashville Gift Guide is coming soon! 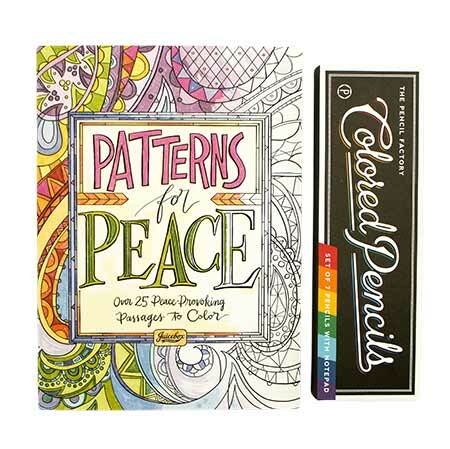 In the meantime, we created this free downloadable Holiday Gift List just for you! Just click on the image below to download the PDF, print, and start making your list and checking it twice. Enjoy!